So you've identified a dynamite company - the most lucrative investment opportunity of your lifetime? Outward appearances can be deceiving, so now you need to look under the hood and see if everything's running the way it's supposed to. And for a business, underneath the hood means the company's financial statements. To accurately predict your rate of return on any investment, your assumptions need to be reliable. If your most basic assumptions swing wildly in one direction or another, your expected return will be nothing more than a wild guess. So the most important factor in determining a company's value is consistency. Consistency allows you to make reasonable assumptions about the future. And if you want to make a reasonable assumption about the future value of a company, then it needs to have consistent earnings. Which company appeals to you most as a potential business owner? Because of consistency. You know what to expect, and you can make plans based on the expectation of that consistency continuing well into the future. 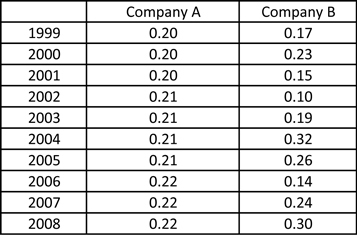 In this case, the total ten year earnings for Company A and Company B are identical. 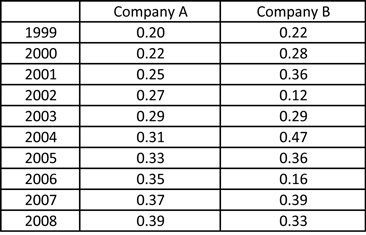 But can you see how predicting Company A's 2012 earnings is a lot easier than predicting Company B's? In fact, forget 2012... Who can predict Company B's 2009 earnings with any confidence? Much less five or ten years down the road! If you're going to estimate a company's future earnings and project its future value, consistent earnings are essential. Not only do consistent earnings provide invaluable insight into future earnings, but they're also a telltale sign of a strong and healthy business. If a company is consistently profitable year-after-year, then it's probably profitable during both boom times and recessions. Its products and/or services probably have some sort of sustained competitive advantage which allows the company to remain consistently profitable. That's always a good sign. For instance, let's look at The Coca-Cola Company (KO). Coca-Cola is the number one most recognized brand in the world. The company's main product, Coca-Cola, has a significant advantage over generic knock-offs. Because people know what they're getting with a Coke. They don't always know what they're getting with a generic brand, and they're willing to pay a few extra pennies for that comfort and familiarity. And those extra pennies add up to enormous profits. "It's such a huge advantage to be by far the best-known gum company in the world. Just think of how hard it would be to replace that image. If you know you like Wrigley's Gum and you see it there for two bits, are you really going to reach for Glotz's Gum because it's 20 cents and put something you don't know in your mouth? It's not worth it for you to think about buying an alternative gum. So it's easy to understand why Wrigley's Gum has such a huge advantage." Companies with pricing power are, in most cases, extremely profitable. This is a good sign not just for profits, but for sustained profits. Force a business to compete on price and its margins will shrink until the very existence of the business as an ongoing concern comes into question. This is the typical life cycle of a commodity business (one with no identifiable competitive advantage). So avoid companies with no identifiable competitive advantage. Because when you have a product that's essentially identical to your competitor's product, then your only available option is to compete on price. This eventually sparks a price war which destroys the profit margins of all the businesses involved. But branded products and services don't have to compete on price. Consumers are willing to pay a little bit more for the quality they promise. As a result, companies selling branded products and services can raise prices every once and a while without losing market share. This leads not only to a stream of strong and healthy profits, but a growing stream of corporate earnings capable of out-pacing inflation. If you want your Roth IRA's investment returns to generate a comfortable sum for your retirement, it's absolutely necessary for your returns out-pace inflation. Because over time, inflation eats away at the purchasing power of your savings. For example, if your Roth IRA returns 5% annually for thirty years, but inflation over the same time period is also 5%, then you haven't earned a dime on your money. You've just been marking time. Owning a slice of the earnings of a great business can help you overcome the inflation obstacle. Inflation is 4%. Commodity prices rise along with inflation, so as a result, the raw inputs for most products are more expensive. In an effort to pass along the higher cost of producing its products, a commodity business increases the price of its product by 4%. But one of its competitors, a branded business, increases the price of its product 5% because market research reveals its customers will gladly pay a little bit more for the familiarity their product offers. That extra 1% price increase adds up to a lot, and the branded company just increased its profits and profit margin at a rate faster than inflation. By now, I hope you realize the benefit of consistent earnings. But you want more than just consistency. You want increasing earnings as well. After all, the purpose of investing in a company is to grow your initial investment into a far greater sum at some point in the future, right? If you want more money in the future, either through dividends or a higher stock price, then it stands to reason that you'll need higher earnings. So a long-term trend toward higher earnings is highly desirable as well. Why wouldn't you want an increasing stream of earnings year after year? Yet, surprisingly, untold numbers of people regularly invest their hard earned money in companies with a track record of stagnant or declining earnings. Instead, seek out companies with a history of increasing earnings. So how do you find out if a company has a strong track record of consistent and growing earnings? The best way is to go to your local library and find the Value Line Investment Survey. My local library has the latest releases from the Value Line Investment Survey in several three-ring binders. The first few pages of the first binder provide an alphabetical listing of the 1,700 largest publicly traded companies in the United States. Use this table of contents to find the page number for your company's listing. When you find your company's page, it will have a listing of corporate earnings for the past ten years. These figures are more accurate than those you might run across on the Internet, and they're easily laid out so you can tell at glance whether or not the company's earnings are consistent and steadily increasing. Obviously, as the owner of a company, you want earnings to be consistent year-to-year and to exhibit an increasing upward trend. You wouldn't want the paycheck from your job to markedly increase or decrease month-to-month, would you? 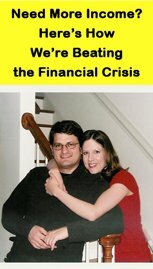 Would you want your paycheck to slowly decrease year-by-year, so you could look forward to less money in the future? So why buy into a company whose earnings offer you the same?